My favorite tournament of the year is here, the Masters! I love the theme song, the par 3 contest, the history and the dramas that always occurs during the Masters. I’ve never visited Augusta National Golf Club but hope to do so very soon to see the golf course in person. Everyone I have spoken with always talks about the elevation changes and the significant slope on each of the greens. Putting well is a key to playing quality golf, winning on the PGA Tour and navigating Augusta National. During a typical round of golf approximately half of a players shots will occur on the green and we do our best to reinforce the focus on putting ability. Most juniors we work with prefer to spend their time hitting drivers so we focus on making putting fun and entertaining. Last week our juniors spent the afternoon working on their putting skills. I only know a few people who can spend a great deal of time on the putting green and I have a tremendous respect for them, I am not one of those people. For me to actually practice my putting I need a few games and drills. I’ve changed my views on putting over the last couple of years. In the past I focused more on the mechanics of the putting stroke, ensuring my putter “matched” my stroke, and ensuring I maintained the “triangle”. The “triangle” is created between my shoulders and hands and to maintain it during the stroke minimum wrist action should occur. I have found most golfers won’t really change their putting stroke or mechanics, frankly I was one of them. I’ve got to stick with my basic stroke but spend time on the skills to make my stroke more efficient and effective. I’ve found it is important to have a few fundamentals in a putting stroke which include; acceleration OR constant swing speed through the stroke, limited wrist action and a consistent setup. On the practice green mechanics are important but many times we (myself included) try to change mechanics while on the course. Everyone has differences in their setup, stroke and pre-shot routine but the key is consistency. As long as you do it every time, you know what to expect. Over the next couple of weeks I’ll introduce a few drills to help hone these skills which will help a player lower scores and become a better putter. I always have to remind myself that drills are just that…drills. They must be fun (or I won’t work on them), be measureable and they must be focused on a specific skill. In the end it’s imperative to translate these skills out to the course since our main goal is to MAKE MORE PUTTS! 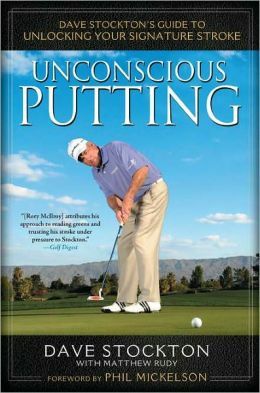 The best resource I have found for making more putts was Dave Stockton’s book Unconscious Putting. This book is an outstanding resource and promotes making a putt while forgetting mechanics out on the course. Check out more of what the Stockton family has to offer here: http://www.stocktongolf.com. I’ve had the opportunity to attend a seminar by the Stockton family and learn about their philosophy in person. Tour players do make it look so easy and make a tremendous amount of putts. They have honed the necessary skills to make putts by using a variety of drills. Drills are important as long as they help us engrain the skills which will help us make more putts. Once we get to the golf course we must focus on one thing, getting the ball into the hole.